"My name is Max." Gather round for you first look at Jamie Foxx as — not Electro, at least not yet. 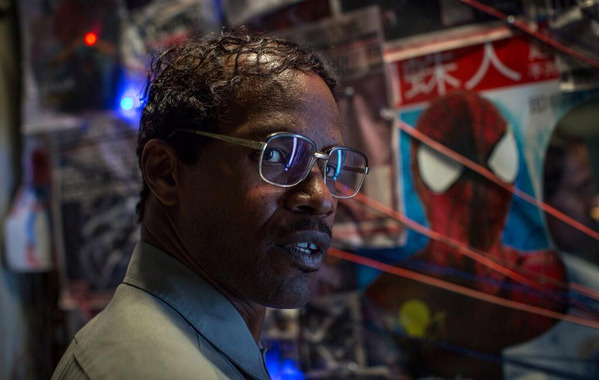 While a number of set photos have popped up showing Foxx with blue skin as the new villain in Marc Webb's The Amazing Spider-Man 2, shooting around New York now, a photo of Foxx as the character Max Dillon has hit the web. The photo shows Dillon, an electrical engineer and lineman, wearing some funky glasses with a cool Spidey poster behind him. 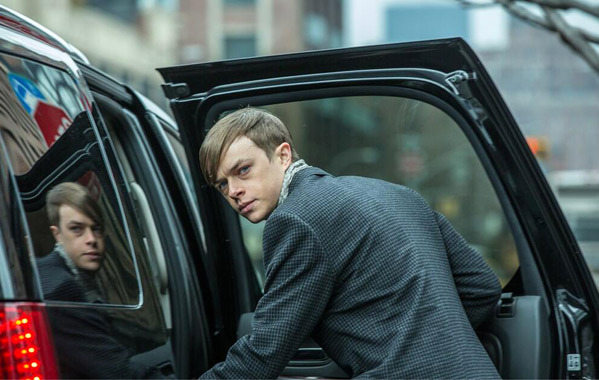 In addition to that shot, Dane DeHaan tweeted his own first look as Harry Osborn, son of Norman Osborn (being played by Chris Cooper). They're not much, but check ’em out. The Amazing Spider-Man 2 is directed by Marc Webb and written by Jeff Pinker, Roberto Orci and Alex Kurtzman. Peter Parker (Andrew Garfield) finds, life is busy between taking out the bad guys as Spider-Man and spending time with the person he loves, Gwen (Emma Stone), high school graduation can't come quickly enough. Peter hasn't forgotten the promise he made to Gwen's father to protect her by staying away, but that's a promise he just can't keep. Things will change for Peter when a new villain, Electro (Jamie Foxx), emerges, an old friend, Harry Osborn (Dane DeHaan), returns, and Peter uncovers new clues about his past. Sony will release Amazing Spider-Man 2 in theaters next summer on May 2nd, 2014. Look good? I dunno if he can top Franco, but it looks like they're going in a different direction anyway. Looking forward to it, even though I didn't like the first very much. That electro's pic looks like an old 80's movie. Max looks like there is a web behind you with strings connecting to different Spider-Man articles what are you up to? A web of mediocrity. Oh Sony, how similar you are to Fox. Marvel will have your head on a platter soon enough. I still wish we got Spiderman 4. I know Rami would have delivered. He did say he wanted to end on a better note then Spiderman 3. Hate the new electro look, the old one was way better. Amazing this is not. I really question the choices made on these Spider-Man films. The CGI was is pretty bad on these films too, particularly the last shot. Nothing will ever beat Spider-Man 3 because it is the perfect super hero movie. I couldn't be more serious. .. They are filming this in a city really close to my house! why do so many people think the Rami films were better? Fidelity to first love? Perhaps the CGI are all they can perceive. Rami is so superficial and predictable. This cast could not be better. With Garfield, Stone, Dehanne, Cooper and Fox who needs special effects? Sure I like Toby but he was just too cute to capture the outsider in Peter Parker. And didn't you guys sense the suffocating, personal claustrophobic world they are surrounding around this Spidey? You know, the Web? It's a much richer version thematically and emotionally, such are human effects a computer cannot generate. The human dimension what made Marvel revolutionary.